This website is operated by Servicing Master Ltd, Oldham, United Kingdom. Throughout the site, the terms "we", "us" and "our" refer to Servicing Master Ltd. Servicing Master Ltd offers this website, including all information, tools and services available from this site to you, the user or our customer, conditioned upon your acceptance of all terms, conditions, policies and notices stated here. By visiting our site and / or using our services, you agree to be bound by the following terms and conditions ("Terms of Service", "Terms"), including those additional terms and conditions and policies referenced herein and / or available by hyperlink. These Terms of Service apply to all users of the site, including without limitation users who are browsers, vendors, customers, merchants, and / or contributors of content. Please read these Terms of Service carefully before accessing or using our website or using our service. By accessing or using any part of the site, you agree to be bound by these Terms of Service. If you do not agree to all the terms and conditions of this agreement, then you may not access the website or use any services. If these Terms of Service are considered an offer, acceptance is expressly limited to these Terms of Service. Any new products, services, features or tools that are added to the site shall also be subject to these Terms of Service. You can review the most current version of the Terms of Service at any time on this page. We reserve the right to update, change or replace any part of these Terms of Service by posting updates and/or changes to our website. It is your responsibility to check this page periodically for changes. Your continued use of or access to the website or use of our services following the posting of any changes constitutes acceptance of those changes. This website is hosted on servers provided by our web hosting providers. They provide us with the online platform that runs our website and allows us to offer our services to you via the internet. You are contracting with Servicing Master Ltd, a service provider operating with web address www.servicingmaster.co.uk and providing services in England. Our mailing address is info@servicingmaster.co.uk. References to "Servicing Master Ltd", "we", "our" and "us" throughout the Terms of Service refer to this website. Our VAT Registration Number is 297255756. 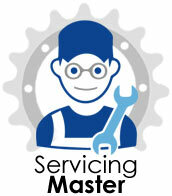 Servicing Master Ltd offers a service using which you can log a service request for your vehicle. By completing a booking and subsequently receiving a confirmation email / phone call / text message for vehicle service, MOT or repairs, you are entering into a binding contract with Servicing Master Ltd.
All person(s) using either our website or calling us by phone to make a booking should be residents of UK and at least 18 years of age. Upon receipt of a booking, Servicing Master Ltd shall provide the customer with detailed costing information of their vehicle servicing before starting any work. All work and costs, including additional work following evaluation at a garage, must be approved by the customer before it is carried out. We aim to complete the vehicle service, MOT or repairs within 1 day. Sometimes, due to reasons beyond our control, late delivery may become necessary. If there is a delay, the service advisor will inform the customer. All additional work is subject to VAT as required by UK law. Depending on your vehicle's make and model, specialist oils may be required for your service. All specialist oils have a prescribed price £15.00 + VAT. Should your vehicle require replacement spark plugs or a new fuel filter, they will be quoted to you on the day of the service. All services provided will adhere to the vehicle manufacturers' service schedules, and the parts used will be of OE quality - thereby ensuring all manufacturers' warranties are validated. 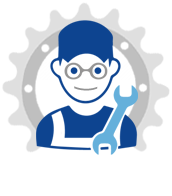 Full support will be provided by Servicing Master Ltd for your vehicle's service history. Your vehicle's service book will be stamped, a copy of the service schedule will be provided and, if applicable, digital service records will be updated after service is completed. All vehicle servicing performed by Servicing Master Ltd carries a 12 months , 10,000 miles warranty, whichever comes first. The warranty covers both materials (replacement parts used) and the related workmanship. The warranty is not applicable if Servicing Master Ltd is not given an opportunity to investigate and rectify any faults within a reasonable timeframe, the manufacturer's vehicle operating instructions are not followed, vehicle is not serviced at a frequency recommended by the manufacturer (for the relevant time and distance), our instructions, advisories, warnings or information is not complied with; The parts or workmanship performed by Servicing Master Ltd is subjected to abnormal conditions or unreasonable wear and tear. Storage of vehicles needing service at the garage is at the customer's risk. Servicing Master Ltd or the garage does not accept any liability for damage, losses or theft during storage of the vehicle while awaiting service. As a customer, you are entitled to cancel a booking or request for additional work up until the day of your service. You can do this by contacting us. If you have already made payment, we will refund the full amount after deducting the charges for any work already completed. We offer complimentary vehicle collection and delivery as standard on all servicing packages. The target vehicle collection time is between [8am and 10am]. The target delivery time is between [4pm and 6pm]. Our representative will update you if there is any delay in collection or delivery due to unforeseen circumstances. If your vehicle is not drivable, recovery will need to be arranged. Vehicle recovery is not included within our free collection and delivery service. We may provide quotations for the cost of vehicle recovery from the designated collection address. Alternatively, you can arrange recovery with your insurance provider or a vehicle recovery company of your choice. Under new MOT test regulations effective from 20 May 2018, a vehicle with defects classified as 'dangerous' may not be driven on public roads in England, Scotland or Wales unless corrective work is undertaken. Unless the defects are fixed, legally the vehicle cannot be driven from the test centre. In such a situation, the vehicle cannot be delivered by us as part of the normal delivery service or collected without a recovery service. The vehicle may be collected by engaging a recovery service at your cost, arranged either privately or with our assistance. If a courtesy vehicle is offered to you for the duration of the service, it will be subject to the garage's insurance. In the event of an insurance claim, you will be liable to pay the excess on the claim. You must agree to all the terms and conditions of the said policy laid down by the garage before taking possession of the replacement/courtesy vehicle. If the courtesy car is not insured, the servicing garage will inform you that you are responsible for providing your own insurance for the duration of use. Servicing Master Ltd or our network garage will not be held responsible for loss, theft or damage to item(s), valuables or monies left in the vehicle when it is given for servicing, including during vehicle collection and delivery. Servicing Master Ltd is not liable for any loss, damage or delay in the services it provides should such services be subject to: an act of God, industrial action such as strikes or government disputes or any other factors outside our control. Where applicable – Servicing Master Ltd will adhere to relevant Health & Safety legislation. By agreeing to these Terms & Conditions you are agreeing to the service schedule specified for the relevant service. You can find the details of our service plans [here]. We will go by your vehicle's manufacturer service schedule. Any additional items not included in our specified service schedule will be added as advisories. Items that are not part of our standard service schedule may involve additional charges. These additional items will be performed only after your consent and approval. In case any complaint arises after a car servicing performed by us, all related communications regarding the complaint and its resolution should be restricted between Servicing Master Ltd and the customer. The customer should not contact the servicing garage to seek resolution or remuneration. We make every effort to resolve all complaints and disputes amicably and professionally within a 28-day period. In case the resolution process is likely to take longer, we will notify the customer accordingly. Should a transaction exceed £1,000 or if in our sole opinion a transaction carries a risk of fraud, we reserve the right to ask for payment to be made via BACS/CHAPS. Our site may contain links to third-party websites or we may direct you to third-party websites for additional information. Content or services provided by third parties are not in our control and we are not endorsing them. Your reliance or use of such content or services is at your own risk. We are not responsible for examining or evaluating third-party content or accuracy and we do not warrant and will not have any liability or responsibility for any third-party materials or websites, or for any other materials, products, or services of third parties. Occasionally, there may be information on our website that contains typographical errors, inaccuracies or omissions that may relate to product descriptions, pricing, promotions, offers and availability. We reserve the right to correct any errors, inaccuracies or omissions, and to change or update information or cancel bookings if any information on our website or on any related website is inaccurate at any time without prior notice (including after you have submitted your booking request). We undertake no obligation to update, amend or clarify information on our website or on any related website, including without limitation, pricing information, except as required by law. No specified update or refresh date applied on the website or on any related website, should be taken to indicate that all information on the website or on any related website has been modified or updated. These Terms of Service and any separate agreements whereby we provide you services shall be governed by and construed in accordance with the applicable laws of [England]. The courts at [Place], United Kingdom shall have exclusive jurisdiction in any proceedings arising out of this agreement.